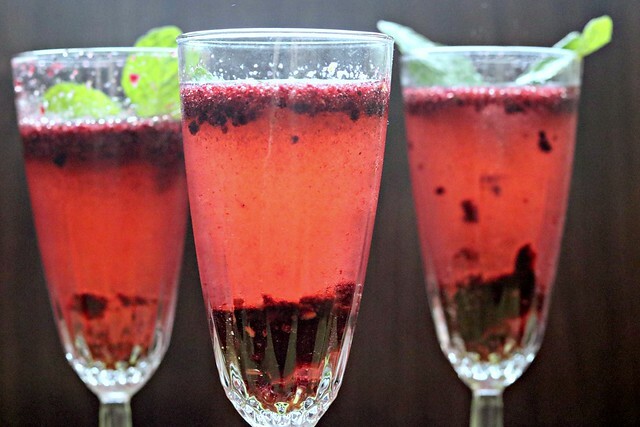 Blackberry and mint puree jazz up bubbly champagne for the perfect brunch cocktail! Happy Friday, friends!! And welcome to day five of #BrunchWeek! Cocktails are typically a signature part of a brunch party, and more often than not a mimosa or mimosa bar is on the menu. Because champagne makes people feel like they’re doing it up a little more fancy. amiright? I am not typically a fan of champagne on its own, but I do enjoy a good mimosa. 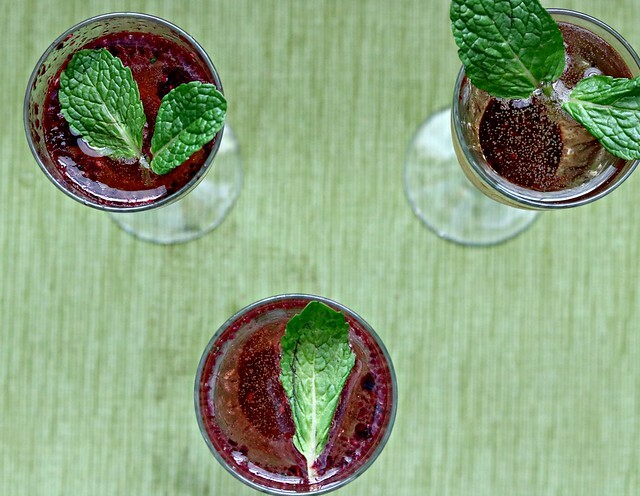 And when I saw this drink right here…with pureed blackberries and mint…I knew it was a cocktail fit for brunch! Now, a Bellini is typically made with Prosecco, but champagne works just as well, especially since there is some added sweetness from the Dixie Crystals sugar in the puree. You are welcome to use Prosecco if that is your preference, but I think the champagne worked beautifully. One of my besties and I host a little brunch for friends every couple of months or so, and when I told her I was going to try this drink out, she told me that if it was good, we may add it to our next menu. Well, my friends, it was definitely good. So good, in fact that I drank the entire batch by myself. Not all at once, but J doesn’t drink wine or liquor and I couldn’t let it go to waste!! The puree will settle to the bottom, so if you want to keep it mixed up, just give your glass a swirl every so often. But the combination of the blackberries with mint and sugar is one of perfection. I love blackberries – they are quite possibly my favorite fruit – and all things mint have my heart, so combine those two with sugar and I am all about it, ’bout it! And how perfect would this be for a Mother’s Day brunch? I mean, what a way to pamper mom and make her feel a little fancy for the day! And because she loves you, she might even share with you. If you’re really nice. 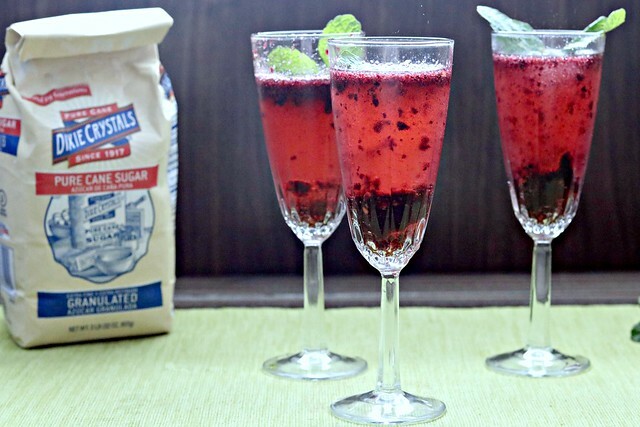 Add the blackberries, mint leaves, and sugar to a food processor or blender. Cover and puree until smooth and combined. Allow to sit for a couple of minutes. Using a fine mesh sieve over a bowl and a spatula, press the puree through to remove the seeds and fruit pulp. 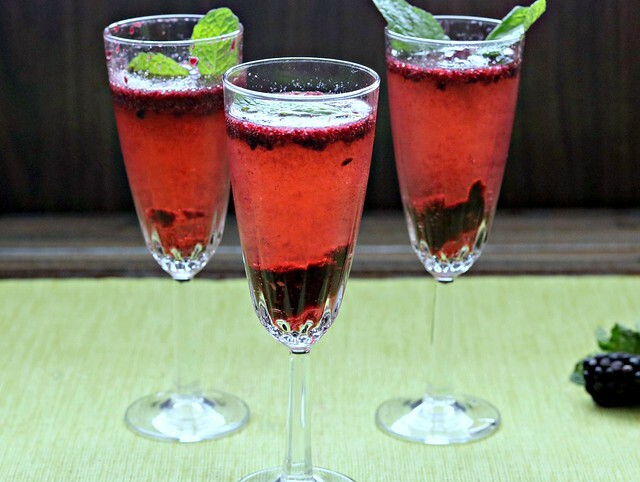 Pour ½ ounce of the blackberry mint puree into the bottom of each champagne flute. Garnish with a sprig of mint, if desired, and serve. Or hide away in your bedroom closet and drink them all yourself. Whatever you prefer!